Emily Dalton recalls talking to the CTO of a large nonprofit that had some of its operations in the cloud and was considering moving one of its legacy systems there. “He said, ‘My goal is to turn our server room into a bathroom.’ For him, it was a no-brainer, you have to do it,” but bringing the rest of the organization along was the challenge. Cloud technology has become routine enough that many organizations have adopted new services during the past year or are considering adding new services, according to the most recent “State of the Nonprofit Cloud Report” by NTEN and Microsoft. Three of four respondents indicated current use of cloud services for at least three purposes. The average number of services used is about six. The cloud might be becoming ubiquitous but it’s not just that a nonprofit’s data is up in the cloud, it’s what is being done there. “The thing that people are abuzz about is AI [artificial intelligence], machine learning and how can we take all the data being generated and harness that into intelligence,” said Dalton, vice president of product management at Omatic Software in North Charleston, S. C. “It’s applying more of the science of fundraising — the art won’t go away, art becomes more valuable in the world of AI,” she said. There are patterns and insights that could be found in the data, pointing to a segment that’s ripe for a major giving ask, she said. Having your database and CRM system in the cloud, “allows fundraisers to do some pretty incredible stuff,” Dalton said. They have access to all their donor data in real time when going to a meeting or on a road trip. Instead of setting up a meeting with a donor, running a report and printing out a donor profile to bring along, Dalton said that fundraiser instead walks into a meeting with the most relevant data possible. “They access it quicker and it’s not duplicated because the cloud is faster,” she said. City of Hope in Duarte, Calif., is testing software with three AI models in partnership with Newton, Mass.-based Gravyty. “We send fundraisers to lunch with people we know have wealth but don’t know they have affinity. Wealth is not enough, it’s just rolling the dice,” said Nathan Chappell, CFRE, senior vice president, philanthropy, at City of Hope. The data can help determine how best to deploy the workforce in the best way possible. “People didn’t even understand it when we talked about it a couple of years ago. We decided to create our own. We’re very diligent about testing models, share what’s working … and go to leadership,” Chappell said. “From an efficiency perspective, it’s the same model but the model gets better every day instead of worse,” Chappell said. Any interaction with a constituent gets better and updated in real time. As vice president for university advancement at the University of Buffalo, Rodney M. Grabowski, CFRE, oversees 45 gift officers but has a universe of 260,000 alumni worldwide. He can’t very well just assign his gift officers to each meet with 5,777 alumni. That would mean almost 16 meetings per day — every day of the year. That’s a lot of lunches. “In reality, I’ve been using forms of AI throughout my entire career. Twenty years ago we were calling it data analytics, then machine learning, now it’s AI,” Grabowski said. The reality is that most people might be using cloud technology, like AI and machine learning, and not even realize it, said Steve MacLaughlin, vice president, data and analytics, at Blackbaud, a Charleston, S.C.-based fundraising technology firm. “The technology is largely invisible. If your organization is taking online donations, then you’re using the cloud. There’s no way to take donations without using some cloud,” he said. For fundraising and donor management, a larger percentage of nonprofits are using the cloud than not, which has been true for a number of years, according to MacLaughlin. “We’re well past the tipping point,” he said. “Now, it’s going to be about what happens next, how does the cloud enable more effectiveness,” he said. There’s a lot of promise to do more with data, which he sees as the third wave of cloud computing for nonprofits. 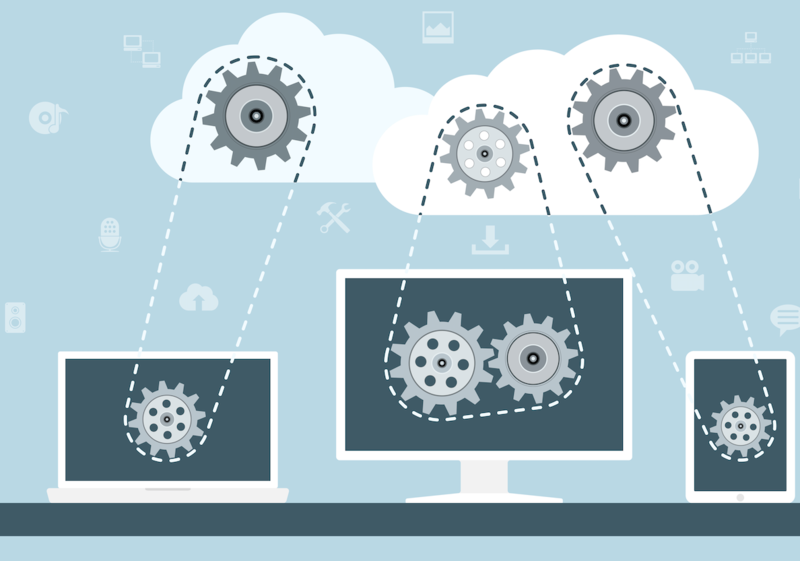 First, it was moving secondary systems to the cloud, like email, and web and digital tools. The second wave transitioned primary systems to the cloud, like programs, HR and other critical systems. The current wave “enables magical possibilities that were never possible with traditional on-premise technology,” MacLaughlin said. “All of the innovations happening in artificial intelligence, machine learning, and performance management right now are cloud native. The cloud makes all of this possible at scale and it’s affordable,” he said. AI and cloud computing are buzz words. But at the end of the day, cloud computing is just the ability to rent capabilities rather than spend heavily on capital, people and security, said Eric Okimoto, chief operating officer at boodleAI, an AI-driven peer-to-peer fundraising platform based in Tysons Corner, Va. The firm was launched this past fall and owners plan to seek Series A funding this spring. “It levels the playing field for small guys, offering very advanced capabilities for smaller nonprofits,” he said. “Whether nonprofit or another industry, it’s the ability to provide advanced capabilities on demand, with scalability to grow as the organization grows,” Okimoto said. Fundraisers can benefit from the same elements of efficiency and access as program or communications staff, said Amy Sample Ward, CEO of Portland, Ore.- based technology nonprofit, NTEN. “Let the robots do the work to tell you that someone just made a donation…instead of running a report to check,” Ward said. Nonprofits still must use the cloud in whatever way makes strategic sense for them, Ward said, not just because other organizations are there. “In the early focus of anything, a big part of that strategy is, ‘Let’s just try it and learn.’ Let’s refine that in 2019, rather than, there’s another option, we need to go try it, too,” she said. What used to be the primary objections to cloud computing — like security, cost and control — have become reasons to go to the cloud, according to MacLaughlin. What’s likely to become more of an issue this year and beyond is data access, security and privacy, Ward predicted. “It’s going to happen anyhow but things like GDPR (General Data Protection Regulation) and data breaches accelerate it,” she said. When PCI (Payment Card Industry) compliance was instituted earlier this decade, there was a fear that the industry would require nonprofits do all these things like credit cards did. “Well, these are things you should’ve been doing anyway,” MacLaughlin said, much like GDPR enacted in the European Union (EU) last year. Canada is working on its version of GDPR as is the state of California, and the U. S. will get some version of it, he predicted. “Now that we have all this data, using it in the cloud, how are we making sure we have the right security and access,” he said. Security protocols are critical even when your server is not in the closet. Most breaches are not a failure of the cloud but failure of organizations not having proper security, Okimoto said. More often than not it is the result of a staff member who allowed entry into the system by clicking a link they should not have hit. Amazon Web Service (AWS) and Microsoft Azure are constantly monitoring threats, he said, adding that nonprofits can’t compete with those cloud providers when it comes to their own server and security. What nonprofits value about cloud tools is that staff can access data and systems to do their jobs from wherever, Ward said, but security is important when they evaluate such tools. “When we talk to nonprofits about security, it’s usually an amorphous, shadowy fear. It’s not a specific security concern,” Ward said. Everyone already is using cloud tools, she said, the issue is whether nonprofits are using them safely. Organizations don’t invest enough in training staff how to log in when they’re not in the office, especially for fundraisers, who could be accessing sensitive data about donation history or earnings. A fundraiser who steps away from their laptop at a Starbucks is a more likely security threat than any hacker or Russian Twitter trolls. Often, it’s probably safer to work with a cloud vendor or partner on security than for a nonprofit to try to maintain that security on its own, Ward said. A company with expertise and resources for the cloud typically would have far more capacity to handle it than a small nonprofit that might not have the IT staff. Smaller nonprofits also could have an advantage when it comes to the culture change of migrating tools to the cloud, she said. And as much as data breaches might still headlines in spite of cloud computing, Ward said the cloud likely is safer to maintain in the long run, and a great place in talking to potential vendors about how to know that’s secure and understanding how to protect their data. Still, there may be some hesitation, particularly within healthcare given the regulations, about security around data. But there’s been a shift in the responsibility for the data to the vendor with regulations like the GDPR, Dalton said. The starting point for any nonprofit, even a small one, is ensuring they’re capturing all the data possible. “The model will be only as good as the quality and consistency of data,” Chappell said. As with anything, he said, determining what you want to accomplish is critical. “AI is so many different types of technology,” and where most people fail is they go forward but don’t clearly define what they want to accomplish.